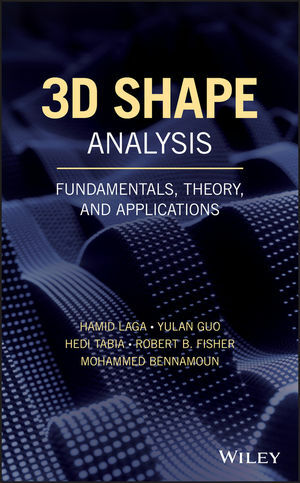 This book discusses the different topics that come under the title of "3D shape analysis". It covers the theoretical foundations and the major solutions that have been presented in the literature. It also establishes links between solutions proposed by different communities that studied 3D shape, such as mathematics and statistics, medical imaging, computer vision, and computer graphics. The first part of 3D Shape Analysis: Fundamentals, Theory, and Applications provides a review of the background concepts such as methods for the acquisition and representation of 3D geometries, and the fundamentals of geometry and topology. It specifically covers stereo matching, structured light, and intrinsic vs. extrinsic properties of shape. Parts 2 and 3 present a range of mathematical and algorithmic tools (which are used for e.g., global descriptors, keypoint detectors, local feature descriptors, and algorithms) that are commonly used for the detection, registration, recognition, classification, and retrieval of 3D objects. Both also place strong emphasis on recent techniques motivated by the spread of commodity devices for 3D acquisition. Part 4 demonstrates the use of these techniques in a selection of 3D shape analysis applications. It covers 3D face recognition, object recognition in 3D scenes, and 3D shape retrieval. It also discusses examples of semantic applications and cross domain 3D retrieval, i.e. how to retrieve 3D models using various types of modalities, e.g. sketches and/or images. The book concludes with a summary of the main ideas and discussions of the future trends. 3D Shape Analysis: Fundamentals, Theory, and Applications is an excellent reference for graduate students, researchers, and professionals in different fields of mathematics, computer science, and engineering. It is also ideal for courses in computer vision and computer graphics, as well as for those seeking 3D industrial/commercial solutions. HAMID LAGA, PHD, is an Associate Professor and Head of the Information Technology discipline in the School of Engineering and IT, Murdoch University, Australia. He is also Adjunct Associate Professor at the Phenomics and Bioinformatics Research Centre, University of South Australia, Australia. YULAN GUO, PHD, is an Assistant Professor in the College of Electronic Science, National University of Defense Technology (NUDT), China. He is also a Research Fellow at the Institute of Computing Technology, Chinese Academy of Sciences, China. HEDI TABIA, PHD, is an Associate Professor at École Nationale Supérieure de l'Électronique et de ses Applications (ENSEA), France. ROBERT B. FISHER, PHD, is a Professor at The University of Edinburgh, United Kingdom, where he was previously Dean of Research in the College of Science and Engineering. MOHAMMED BENNAMOUN, PHD, is a Winthrop Professor in the School of Computer Science and Software Engineering at The University of Western Australia, Australia.